A meeting organised by the Ghar Bachao Ghar Banao Andolan on the occasion of the International Women’s Day revealed how even in Mumbai, known for being the country’s most women friendly city, women’s safety and well-being depends on the area in the city they occupy and the kind of material structures they live in. 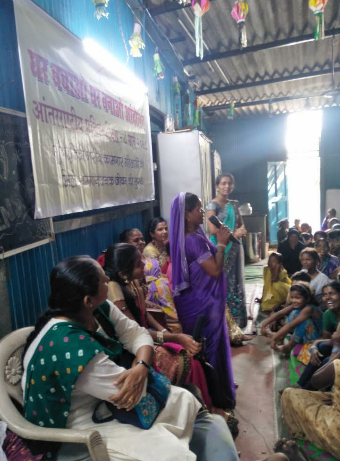 Testimonies at the meeting, attended by around 100 women from several slum pockets in Mumbai, revealed that lives of women in these settlements are several times worse off than that of their counterparts from the upper classes who live in regularised buildings. Not only do the former have to shoulder the burden of arranging for basic amenities like water, unavailable at their door-steps, they must also deal with ever-present threats demolition and the sexual abuse and molestations that follow. 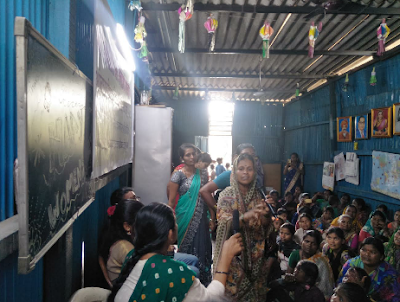 “When our homes are evicted without notice, we are left on the roads, with no toilet facility,” said Sushila Gulab Kale, a resident of Jai Ambe Nagar slum located in Govandi. “It puts our safety at risk in several ways, including possibilities of sexual molestation”, she said at the meeting. Those who gave testimonies also came from Sathe Nagar, Mandala, Bheemchhaya and Sanjay Nagar. Fatima, spoke of the perils pregnant women have to face. “My daughter gave birth to her child and three days after our house was demolished by the government. We spent nights without shelter. No words can explain the pain that we went through after eviction,” she said. Working as a sweeper on sub-contract with the Mumbai municipal corporation, further said even though she cleaned the gutters and gave sheen to Swachh Bharat, she lacked the basic toilet facility in her slum. “I clean gutters through the entire day. But we in our slum, we are forced to defecate in the open, as there is no toilet. Even then, people living in high-rise buildings adjacent to the open ground where we defecate throw stones at us. You tell us what are we supposed to do?" She added, "It implies that if one can afford to buy a house only then he/she will have a house and if one cannot afford to buy a house then there is no provision to get the protection of even a minimum shelter." The meeting saw participants pointing out that the commoditization of housing is the reason why slum housing comes into being. The demolition of slums has not eradicated poverty but have forced people to become homeless, voiceless and invisible population of the city that ironically are also workers and toilers. These workers are toilers are responsible for subsidizing of economy at a large. Slum demolition has become a norm in major cities like Mumbai, it was felt. A number of women at the gathering expressed their anger on false promises made by every politician before elections. “We have spent several years seeing politicians come to us with folded hands and promise us better facilities. After the elections, everyone forgets us. The only things the politicians leave behind are words. Shall we hold the words, like we hold air? They simply betray us”, said Maya Sutar from Jai Ambe Nagar. “We get paid for our hard work but politicians only make hollow promises. We are honest people, they are liars” added Sutar. Women at the meeting agreed, there is no end to their suffering if they not fight themselves to make their lives better. “Though we are suffering, we have not given up. We will fight and we will win”, said Jameela Begum of Sathe Nagar slum, who moderated the meeting, which took place in Jai Ambe Nagar.